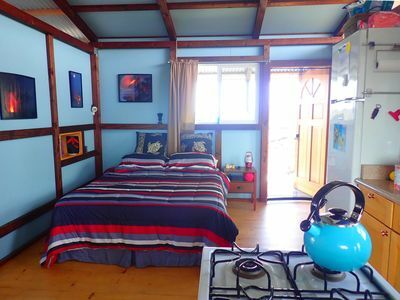 Volcano Home w/Shared Hot Tub in Lush Rainforest! 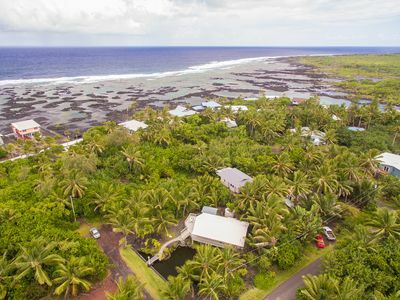 Nestled in nearly 60 acres of pristine Hawaiian rainforest, ‘Hauoli Hale’ makes it easy to immerse yourself in the tropical culture of The Big Island. 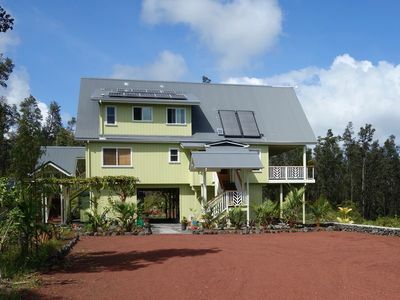 With 3 bedrooms, 2 baths, wheelchair accessibility, and a prime location, minutes from Hawaii Volcanoes National Park, this vacation rental house is the perfect spot for 6 guests seeking a memorable getaway! 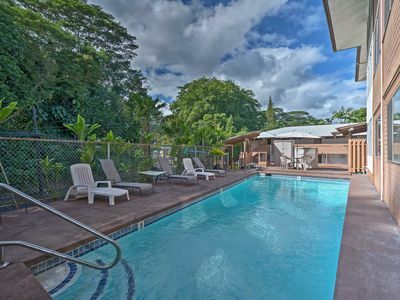 Surrounded by lush plantings in a peaceful rainforest, ‘Hauoli Hale’ will quickly become your favorite escape from the hustle and bustle of everyday life. 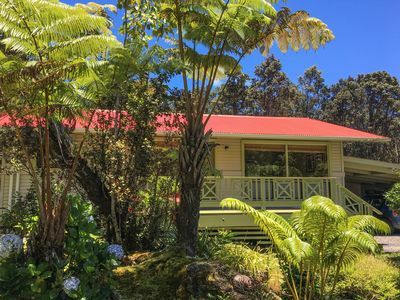 Sit back on the private, furnished deck and take in the views of some of the largest Ohia trees on the island, as well as 30-foot tree ferns, beautiful plants and the frequent animals you may see strolling by. 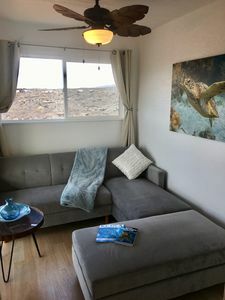 Look forward to sipping your morning coffee on the wheelchair accessible wraparound deck, and spending your evenings soaking in the hot tub, which is shared with the other vacation rental units on the property. 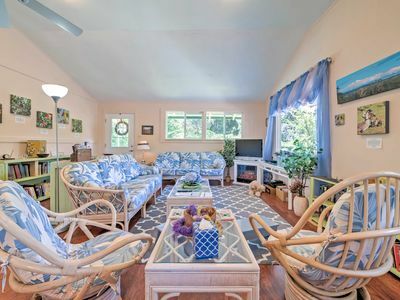 Inside, tropical decor, comfortable furnishings and an open, bright layout truly reflects the name of this ‘Happy House.’ During your downtime, kick back on one of the blue, floral couches or chairs and watch a movie on the cable TV while staying warm by the electric fireplace. 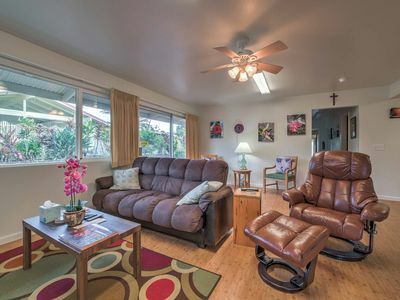 Hardwood floors and numerous windows flow throughout the living room and into the open kitchen area, which features a charming dining table for 6 and another round table with a floral tablecloth, along with a kitchen, well-equipped with everything you’ll need to prepare delicious meals. After each exciting day, rinse off in one of the 2 pristine bathrooms before heading to bed. 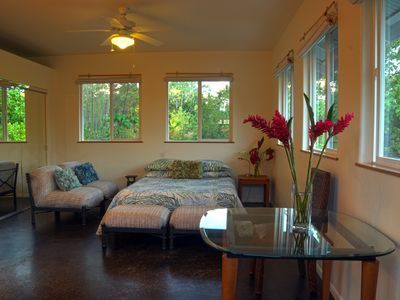 Each of the bedrooms feature a heater and comfortable beds to rest your head. 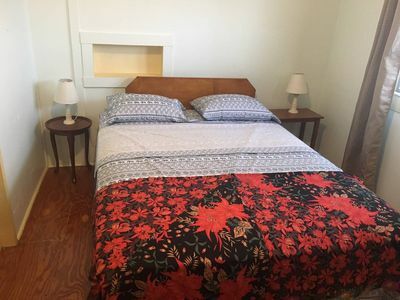 The master bedroom (Nene) has a king bed with an en suite, wheelchair-accessible bathroom, the second bedroom (Elepaio) has a queen bed, and the third bedroom (Apapane) has 2 twin beds, all guaranteeing a peaceful slumber. 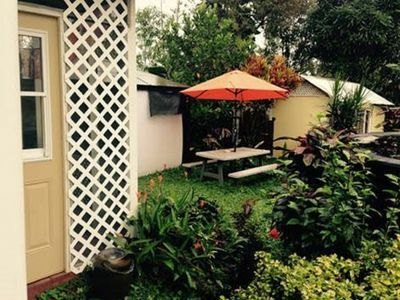 This house is perfectly located for you to explore everything that the area has to offer! 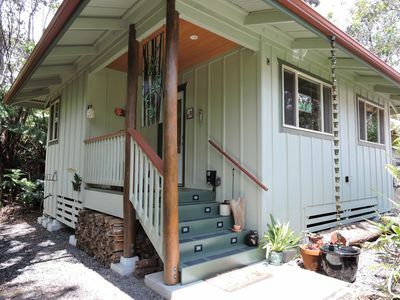 You’ll have no problem relaxing at the property, as you can sit back on the deck or hike along the trail in the backyard. Be sure to keep your eyes peeled for native birds, feral pigs, numerous flowers, and fruit trees in the orchard. 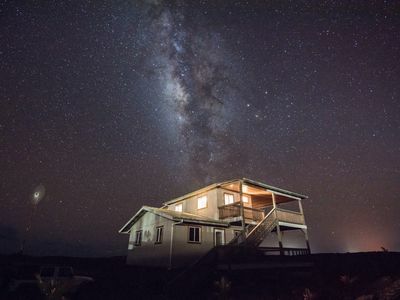 Whenever you can pull yourself away from the tranquil property, you’ll find more natural beauty at Hawaii Volcanoes National Park, just 10 minutes away. Check out the Halemaumau Crater, which has been ‘bubbling’ since 1952, and catch a magnificent view from the Thomas A. Jagger Museum overlooking the rim of the crater! 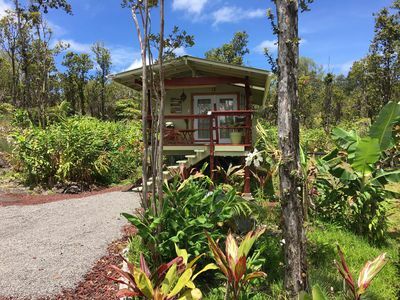 Camping sites and hiking trails also abound in the park, including the Thurston Lava Tube and Namakanipaio Bird Park. 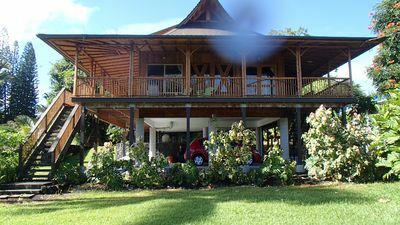 If you’re not in the mood for home cooking, drive just 7 minutes from the house to reach Volcano Village, where you’ll find 2 grocery stores, along with restaurants and cafes. In the village, you’ll also find a laundromat, in case you need to wash your clothes while on vacation. 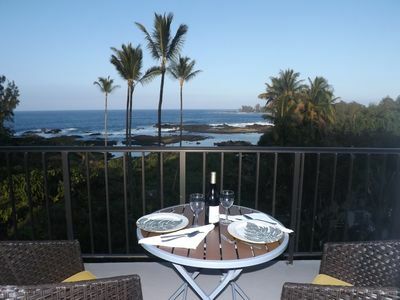 Golfers and wine lovers alike will be happy to visit Volcano Golf Course and Winery, just 15 minutes from the property. You can’t visit Hawaii without going to the beach! Pack your beach towels and beach toys and head 40 minutes to the Punaluu Black Sand Beach, where you’re sure to see green sea turtles basking in the sun. 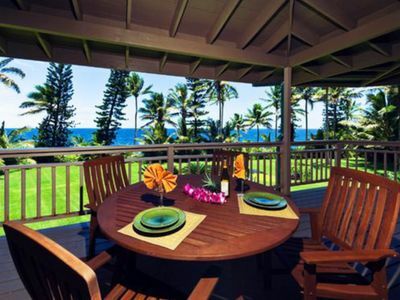 Once you’ve had your fill of beach time, head to Punaluu Bakery to enjoy lunch in several gazebos on your way to Kona. 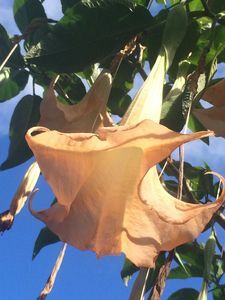 If you’re up for a day trip, drive 45 minutes to Hilo, where you can visit museums, gardens, an observatory and waterfalls! 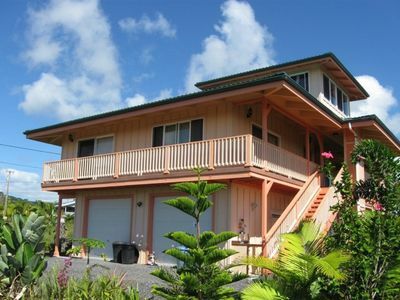 - Great Volcano location in a beautiful rainforest - Easy access to Hawaii Volcanoes National Park, Volcano Village, Volcano Golf Course and Winery, Punaluu Black Sand Beach, and Hilo! Lava Viewing House on the Kalapana coast. Once in a LIFETIME Experience! 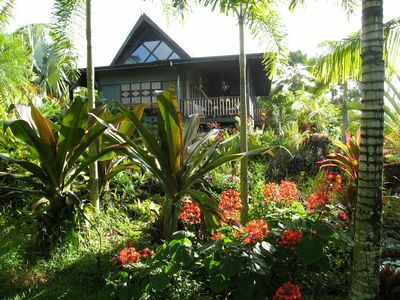 Volcano Off the Grid Eco Cabin Retreat in the heart of the tropical raiforest.